Every culture has their kebabs, from lamb kebabs in the Middle East, pork souvlaki in Greece, chicken yakitori in Japan, ground beef kebabs in Morocco, chicken pinchos in Spain, to beef heart anticuchos in Peru, you could travel around the world and be sustained on a kebab-only diet. What makes the Peruvian anticuchos unique is the marinade — a dark red blend of smoky aji panca, spices, vinegar, and lime juice that fills the air in the streets of Lima, where a line around the block is typical for the best anticucho street vendors. To make this traditional Peruvian dish more accessible, this recipe uses shrimp instead of beef heart, and the shrimp is cooked in a skillet instead of over the grill. 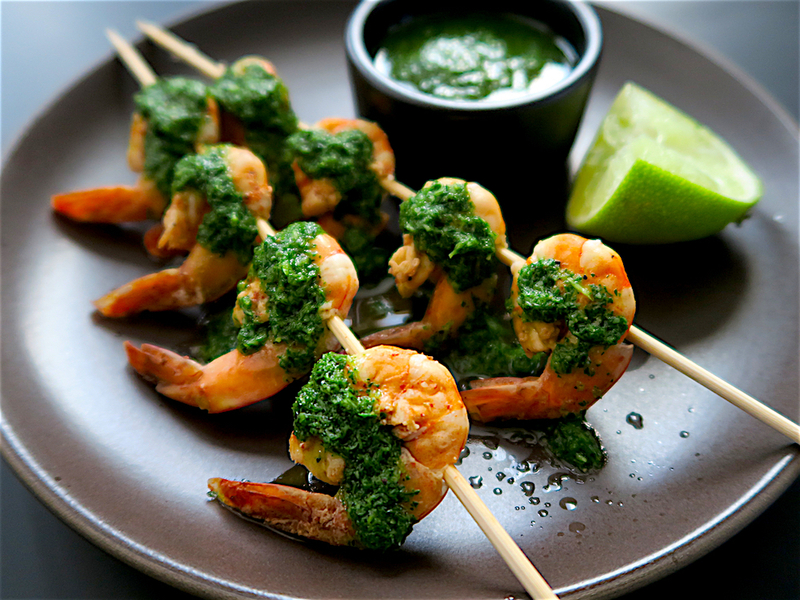 With a nod to Argentinian cooks, the shrimp is served with a chimichurri sauce made with parsley and other spices that complement the anticucho marinade. Make these Peruvian shrimp anticuchos at home and get ready for the line of friends and neighbors waiting to get their fix from the most popular kebab cook on the block. In addition to the ingredients above, you’ll need a sealed container for the marinade, skewers for the shrimp, a skillet, a blender to make the chimichurri sauce, and a ramekin. 4 skewers, each with 4 shrimp. Make sure the skillet you use is large enough to fit the skewers with the shrimp, otherwise sauté the shrimp without the skewers. For presentation, you can place the shrimp on the skewers after sautéing.